Egregor Music is happy to announce their third release, Ancestral Vortex, the long-awaited debut mini-album from Argentinian audio wizard Ñutram Kalku. Consisting of five sound vortices meticulously designed in an intensive analysis, this release draws influence from various styles of psychedelic trance as well as free experimentation with many sound design, programming, composition, and mixing techniques. Here you will discover a sonic story inspired and guided by our ancestors and a host of myths, legends, and historic events as well as scientific, astronomical, and anthropological inquiries into our origins and those of the mysterious entities and creative forces that led to our existence as human inhabitants of planet earth. 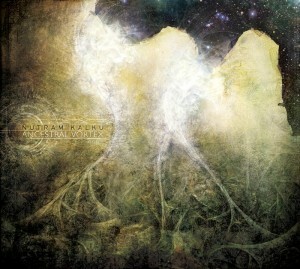 All tracks written, produced and mastered by Ñutram Kalku at Aurea Lab Studio with artwork design by Trulppacum. MP3 Download | FLAC Download | WAV Download · Download count: 10,765. Excellent album, very dark and loud !! Congrat’ for this release. Thanks to all involved in making this happen. One of my favorite releases this year – a perfect example, in my opinion, of how much potential Darkpsy really has. Fantastic indeed! Thanks. But how does it sound so much like Kindzadza – Insoluble…? Has Kindzadza released some soundbank, or are these from some standard dark psy bank…? I mean there is a LOT of same sounds that are used in that album..